The place seemed very new since everything was in pristine condition. 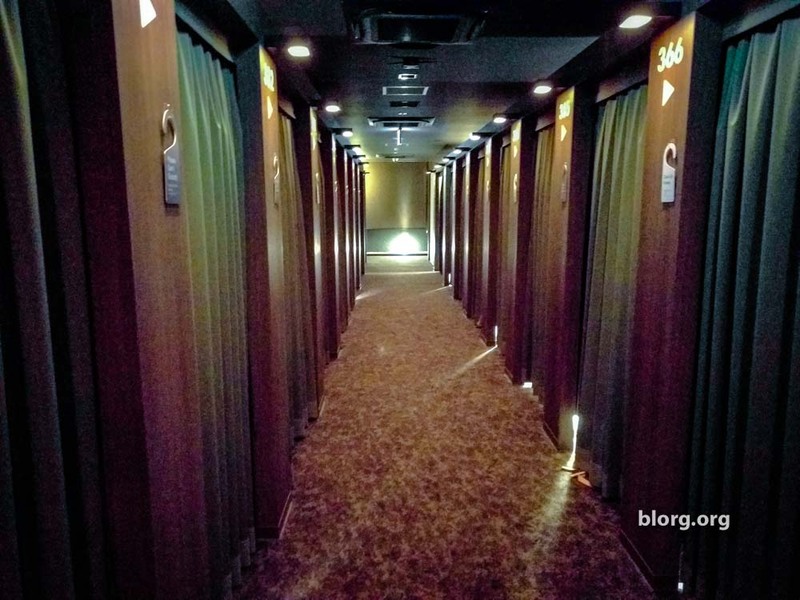 This was probably the nicest capsule hotel (if that’s even the right term) that I’ve ever stayed in. We stayed for 2 nights for $58 total through Expedia. That’s the price after using Expedia’s Best Price Guarantee and matching with Agoda. That means, I’ll have a $50 Expedia coupon a month after my stay. My total for this 2 night stay is now $8USD! It’s an old post so they’ve changed a few things. You can only get 3 certificates per month after you actually stay at the hotel. The staff spoke pretty good English and we had no problems checking in. At the front desk, you can pick up all the amenities you would like. They give you a reusable cloth bag to pick out your amenities (nice touch!). I picked up pajamas, a washcloth, toothbrush and proceeded my way towards my cabin. On the ground floor, there’s an entrance to the men’s section, women’s section and a lounge. Just before the lounge, there’s a station for free water and coffee. There’s also a vending machine with beer and other drinks. They also sell craft beer at the front desk! If none of that works for you, there’s several 7-Eleven’s in walking distance. After entering through the men’s section on the ground floor, it immediately leads into the locker room. The lockers are big enough for a large backpack and your shoes. If you have large luggage you can store it in your cabin. Inside your locker, you’ll find a pair of slippers to change into. I was staying on the 3rd floor so had to walk up two flights of stairs. There was no elevator…or maybe I just didn’t see it. When you enter the 3rd floor from the stairs, it leads into the lounge area. To your right, you’ll find a bar of desks to sit at, a vending machine and a small smoking room. The lounge area consists of a massage chair, several lounge chairs, shared refrigerator and magazines/flyers. To your left will be the restroom and showers. Walking straight through the lounge leads into the cabins. Inside the cabin is a tiny vertical room. Imagine a twin sized bed with walls on the side. This is much better than most capsule hotels since you don’t have someone above you. There’s a TV along the wall and it swings out. The only thing to be careful of while sleeping is the noise. It was hard to sleep at first since there was some guy in the room rifling through his noisy plastic bags. They sell earplugs at the front desk for 50JPY. The restroom is split into two sides. The left side is the shower section with separated sinks/seats. The sinks/seats are so you can shave, brush your teeth or whatever you need to do to start your day. On the right side are the toilets, urinals and additional sinks. As we were preparing to climb Mt. Fuji at night, we started talking to the staff and owner. They were VERY nice! We chatted for awhile before our taxi arrived to take us to Mt. Fuji’s 5th station. We took a picture with them and they walked us outside, wished us good luck, and happily waved as we drove away. Amazing stay and will only stay here if I try to climb Mt. Fuji again.